Free Shipping Included! Sterling Silver Rose Tone Diamond-Cut 9+1'' Bead Anklet by Beaux Bijoux at Kollaboration Chicago. MPN: amr9101. Hurry! Limited time offer. Offer valid only while supplies last. 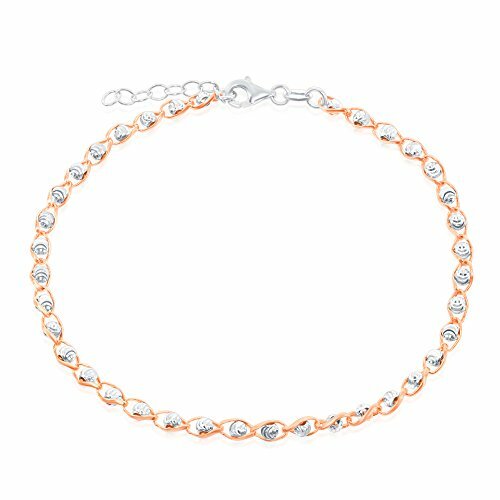 Define your look with this beautiful Sterling Silver Rose Gold or Gold Plated Diamond-Cut 9+1'' Bead Anklet! This stylish anklet is sure to make a statement due to the nice and clean look it possesses. The anklet is nicely crafted with interlocked chains followed by a 4mm diamond cut bead in the center of each chain. To make the anklets stand out even more, the chains are plated with gold or rose gold to make a bold a statement. You can pair this up with casual attire or to any event that you desire due to the color on the anklet. The anklet extends from 9 inches to 10'' and it comes with a lobster claw clasp for your comfort. The chain is the perfect gift idea women of all ages due to the elegant look of the chain! This is a stunning piece of jewelry that is sure to make a statement to any person that possesses it. Each of our items are expertly polished for a beautiful finish and crafted with Sterling Silver. PERFECT GIFT: This is a stunning piece of jewelry that is sure to make a statement to any person that possesses it. This is the perfect gift idea for many occasions, such as Mother's Day, Valentine's Day, Christmas, Graduation, Wedding, Bridal, Bridesmaids, Religious Event, or any other Special Event.